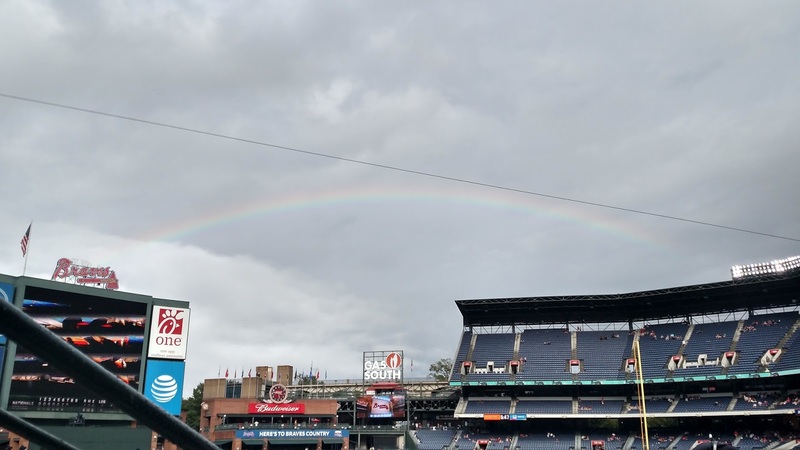 The Atlanta Braves are finishing up their last season at Turner Field. 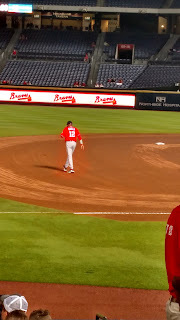 In the midst of another crazy busy stretch where I worked 16 days out of 18, and it wasn't a sure thing that I was going to get the day off, I took Shyam down to Atlanta to see the Braves play the Nationals. She roots for the Nationals. This has not been a bone of contention between us. However, we will see what this postseason brings. Anyway. I've always been a well-wisher for the Braves. A supporter, I reckon. They're a couple or three hours south of here, depending on Atlanta traffic. I had a stretch where I saw at least one game in Atlanta for 23 seasons or so. That got broken a couple of years ago, where things just didn't pan out. 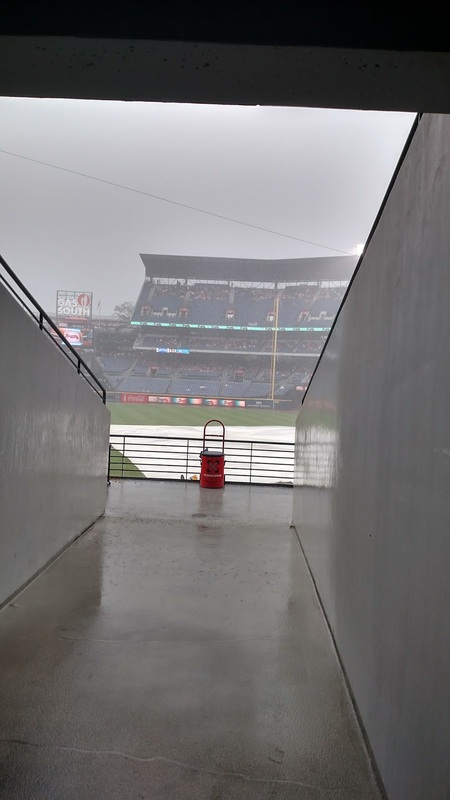 That being the case, I've seen a lot of baseball at Turner Field, which has become a casualty of the disposable economy we've crafted that is built by the lowest bidder and succumbs to the idea that Newer is Automatically Better. The Braves are moving next year up the road a few miles to Marietta. It's a move that gives me mixed emotions, despite this aggravation. I'll say that one of the things that's kept me from hitting more Braves games in the past handful of years is my own lack of willingness to fight Atlanta traffic. I'm not sure how many more miles it saves moving from around the capitol, but there's a difference of about 12 mile markers. That difference has meant anywhere from 20 to 60 minutes, depending on the rush hour. Assuming clear roadways, I could make it from work to the Marietta stadium in a much less daunting 2 hours (or less). Still, the David Cross bit about the suburbs of Atlanta, where it stays White out later keeps popping to mind. Anyway. There was a call to Elisson to see if they would enjoy taking in a baseball contest. Alas, they were already planning something for the day. We'll hit a game with them soon. They've been inviting me down for years, and even with my crazy schedule, I'm a bit of a heel for not having taken them up on the offer. We arrived about an hour before game time, so that we could take one more stroll around the stadium. Lots of memories there. Lots of Cubs games, including a couple of playoff games. A few more Braves postseason games. Lots of hot summer Atlanta days spent watching the Red Sox, or the Yankees, or the Cardinals, or the Astros or any number of opponents wander through. Favorite memory? Finding out the Cubs were making a two-game early season visit the same night as a meeting about 50 miles north. Wandered to the game after the meeting, walked up and got a seat on the wall right off the right field line. Had Carlos Zambrano make eye contact and give me a nod as he made his way to the bullpen for warmups. For this game? Saw the Nationals pitching struggle against a Braves lineup that played surprisingly good small ball and situational baseball. Aside from loading the bases early on with no outs and bringing a goose egg from that inning, the Braves played great ball. Here he is drinking a bottle of water. At least, I think it's water. 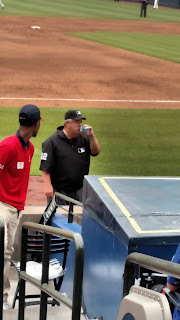 He isn't a good umpire. The rains came late in an otherwise quickly moving game. One rain delay chased us onto the concourse. Play resumed, but rains came again, and continued long after they should have been suspended. The infield was soaked. 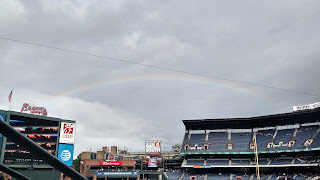 It was during the second rain delay that we caught this rainbow beyond the right field stands. The rain delay continued as the grounds crew worked to get the infield back to playable. Shyam and I were watching the radar on the weather app, and saw another string of showers heading toward the stadium. 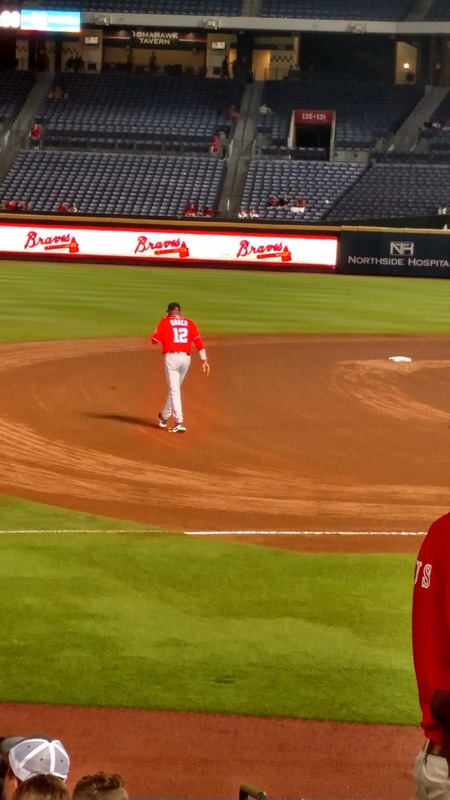 Meanwhile, Nationals skipper Dusty Baker went out to test the infield. Mere seconds after this one was snapped, the rains came again. Shyam and I made a decision neither of us has made before: we left a ballgame early. By the time we got to the car and turned on Braves' broadcast, they were announcing the score as final. Two last items of note: we hit dinner at a Cracker Barrel in Adairsville, Georgia. They were crowded--a busload of Tennessee State athletes had gotten into the restaurant just before we did, and the wait staff was a little overwhelmed. A waitress noticed Shyam and me waiting for drinks, and she took our order. Our drinks were brought by a second waitress, and our food by a third. We flagged down a manager after eating to get our bill. I was entertaining watching three different waitresses poke their heads out from behind the kitchen door and shake their heads in the negative. The manager couldn't find our tickets. He gave us free Cracker Barrel. More power to that man!!!! Also, we are in the midst of a mostly media-fueled gasoline panic in this neck of the woods. I noticed as I got on the interstate that the QT station next to the Cracker Barrel and the station across the street were both out of gas. The panic has hit somewhat more lightly in Athens, this morning, as the Shell station near my house was out of everything but Hi-Test. Anyway. I'm glad we hit the game. Glad we hit one more at Turner Field. A shame that it won't be hosting Major League Baseball anymore. Still, I look forward to the new stadium experience. Glad of another quality day spent with Shyam. That mental refreshment I wrote about eight days ago, regarding the trip to Boston? My first 122 hours back from vacation, I worked 62 of them. I wish I didn't have to pay for a vacation by working a ridiculous stretch after. In celebration of Labor Day, I'll be working my seventh day straight. I'll be celebrating by calling every number at the Home Office in sequence, and if I don't get an actual person, I'll congratulate them for reaching the Caste that actually gets to celebrate holidays.